Brittany (Bretagne in French and Breizh in Breton) is the very large peninsula that juts out into the Atlantic from the North West of France and southwest of Paris and Normandy. 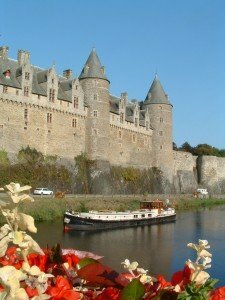 After Provence, Brittany is the second most visited area in France though only a small percentage of foreign visitors other than Brits seem to know about it. I’ll start by trying to give a brief run down on our lovely ‘Celtic Corner’ of France. The history is very different indeed to the rest of France and it was an independent nation until the mid 1600’s and one time was even allied with the Spanish and against France. Its main population came not from France or even mainland Europe but from seafaring celts and the south western parts of England, Wales and Ireland. 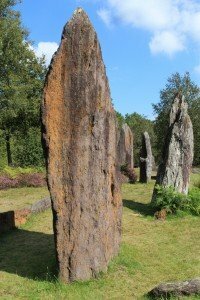 There are also the extremely ancient standing stones that date back over 5,500 years that are the only remaining evidence of the megalithic people who once inhabited this area. The native language is Breton and though something of a ‘hobby language’ nowadays it is still spoken by around 20,000 people, mostly in Finisterre and the off lying islands. It is very close to Cornish, the ancient language of Cornwall which is the southwestern tip of England. Speakers of the two languages can converse quite easily. Perhaps not surprising when you find that part of Finisterre is actually called Cornouille! Move up to Wales and speakers can get the gist of what the other is saying but probably not converse too well. Move up again to Ireland and there are quite a few words in common but the differences are now too great for conversation. Many visitors wonder why street signs appear in 2 languages, well the second one is Breton. Brittany can be divided into several regions, each with it’s own personality. 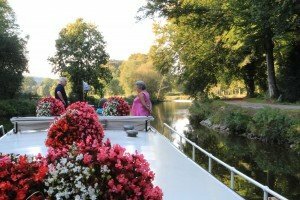 There is the northern or Rose granite coast where you can find the main ferry ports like St.Malo and Roscoff as well as the gorgeous town of Dinan that sits on the start of one of the Breton Waterways. The western part of Brittany is Finisterre a land of wild rugged coastlines, dozens of lighthouses, small ports, clifftop walks and great seafood restaurants. You then have the south coast with beaches that go on for miles, lots of havens for the yachting fraternity, big fishing ports like Concarneau and Lorient as well as some lovely little towns like Pont Aven which was a favourite of Paul Gaugin. However it is the southern coast that sees the huge invasion of tourists in July and August; mainly people who have holiday homes there. Apart from selected favourite spots, we tend to keep clear in the height of summer and keep to the tranquil inland areas. Then there is central Brittany which is fertile, wooded and made up largely of of small hills and wooded valleys, with thousands of small farms and villages nestling in the valleys. It is through this land that we cruise the rivers that make up the Nantes a Brest canal. In medieval times many of the most beautiful and important towns were founded on the banks of our rivers. Nowadays we can actually sail through them as the river has been made navigable with the addition of locks. 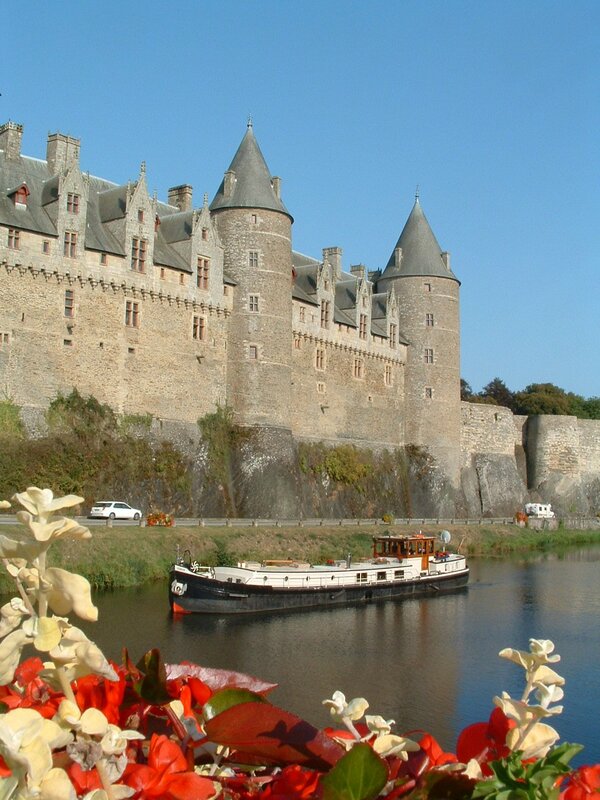 Examples are Malestroit that was founded in 985 and Josselin with it’s magnificent chateau and medieval centre dominating the river. Why did we choose to come here with our barge? Well, there are several reasons but climate is one of them. We do not enjoy the extreme heat of the far south and prefer the climate here which is moderated by the surrounding sea. This means that we do not have to hide from the afternoon sun and can enjoy the whole day. It also means a verdant and fertile landscape. We meet many ex pats who moved firstly to the south of France or Spain but who then move here for a more comfortable life. However, having lived here for many years now what we value most is the helpful and friendly attitude of the locals. Brittany along with the Pays Basque, and Corsica is one of the few regions that retain a real identity with a pride in their unique culture. Whether it is the food, the music, the language or celtic history people here are proud to be Breton. In a recent poll amongst English speakers the words most associated with Brittany were beautiful, authentic, home, space, calm, unspoilt, and wild. For French speakers, authentic came out on top followed by beauty, sea, lighthouses, and land. For us, last but not least came the gorgeous waterways here that are not even connected to the rest of the French canal network. 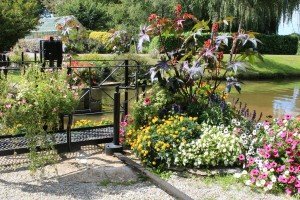 Quiet, well maintained and friendly they are a delight to travel, and at this time of year we are looking forward to meeting all our lock keeper friends again to catch up after the long winter. Life will progress once more through the rhythms of the year. 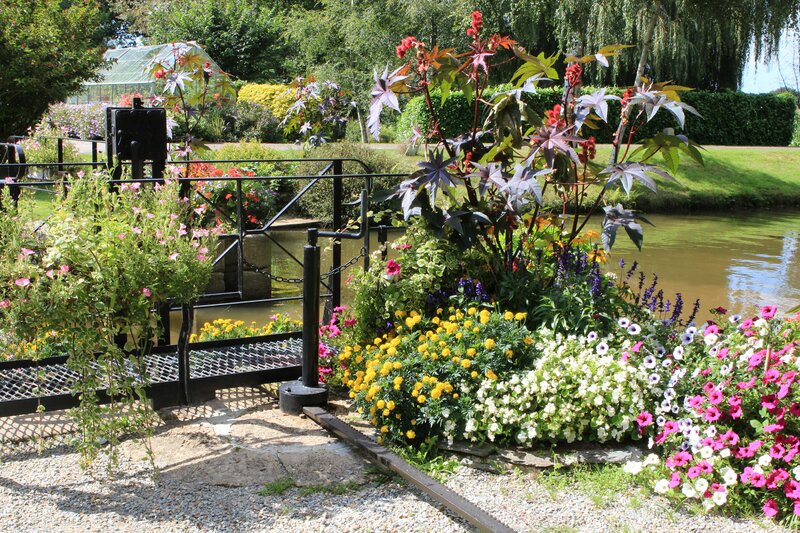 Once spring comes, all the towns, villages and lock keepers will be planting the flower displays that are such an integral part of life here. The farmers will be soon be planting spring crops and we will be slowly cruising through it all, once more feeling very privileged to be in Brittany.